Three hours to charge an EV? How do they do it? A good charging system. Ford formally announced the all-electric Ford Focus today. The car generally meets the specifications and timeline unfurled earlier by the automaker. The car will come out toward the end of 2011, fit five adults, be competitively priced and be the first in a series of all-electrics and plug-in hybrids. As announced earlier, LG Chem, which also makes the battery for the Chevy Volt, will produce Ford's batteries. 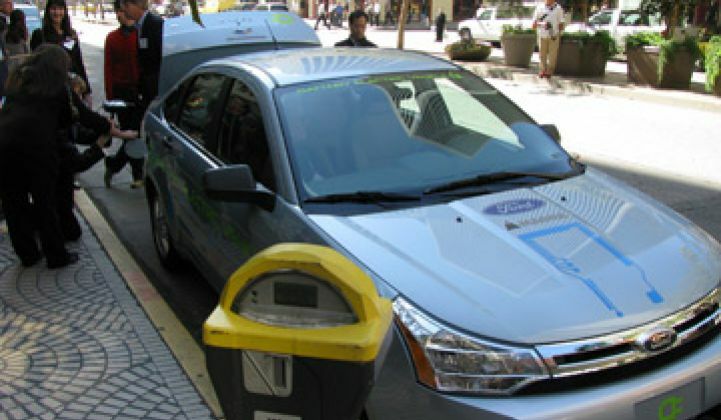 By 2013, Ford wants to have five plug-in hybrids and all-electrics out. Ford has said a plug-in version of the Milan could come in 2012. There are two novelties in the announcement. First, Ford talks about the daily driving habits of Americans. The all-electric Focus was initially targeted at fleet customers. Ford sells quite a large number of cars to fleet buyers and the Focus volumes initially will be low. Thus, expect to see most of these go to corporate organizations, but over time, there may be increasing interest in selling these to consumers. Second, Ford says the Focus can charge in three to four hours on a 240-volt charger, or far faster than a Nissan Leaf or other comparable car. How is that possible? Ford could be putting a small battery in the car, which would reduce the cost but crimp the range. Second, it might have made charging more efficient somehow. UPDATE: We just spoke to Ford spokespeople. The Focus will have a 23 kilowatt hour battery, which is only slightly smaller than the 24 kilowatt hour battery in the Leaf. The car also has an onboard charger with a 6.6 kilowatt capacity versus a 3.3 kilowatt charger on competing cars. Couple that with the 32 amp stationary charging station that Ford reccommends and you get more rapid charging. So think of the Focus as coming with a firehose instead of a garden hose when it comes to charging. Best Buy will be the reccommended installer. Approximately 10 percent to 25 percent of the cars sold in North America will be hybrids and electric cars by 2020, Nancy Gioia, director of Ford global electrification, and other execs have told us. However, the vast majority of those cars will be standard hybrids. In fact, Ford's main push on efficiency will remain the EcoBoost engine, a gas engine that achieves some of the same efficiencies associated with diesel. Another issue to look for: General Motors' Volt is a series plug-in hybrid. Ford will concentrate on parallel plug-in hybrids. It's a philosophical difference, and Ford says the parallel architecture will allow them to be more cost-conscious and nimble. It will be great to see this debate play out in reality. Here is a video and part of our review from driving the car in 2009. To be honest, it's like a quieter version of the regular gas-burning Ford Focus. It features about the same acceleration -- Ford, in fact, installed a governor to tone down the acceleration. The car also seats four adults comfortably. Pedestrians don't stare like they do when you drive a Tesla Roadster. If it weren't for the large stickers announcing that the Focus runs on electricity, most people would probably assume you just picked it up at a Hertz counter. That is the effect, though, that Ford wants. Unlike Tesla or Fisker Automotive, Ford wants to target its hybrids, plug-ins and electric vehicles to the mass market.